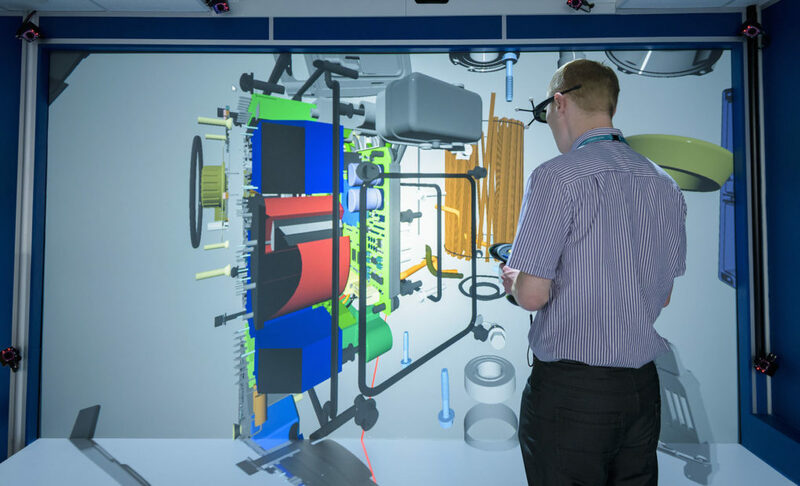 Virtual Reality Applications: Where Else Can You Use It? Virtual reality has been making waves in the gaming industry over the past few years, allowing for VR users to have immersive experiences with the worlds of their video games. However, there are more applications to virtual reality than just enjoying your entertainment on a new level. Several industries are making headway with new uses of VR, heralding new ways not only to view media but our whole world. Here are 12 practical applications of virtual reality you shouldn’t miss. Medical students must go through hours upon hours of observation and study before they can begin to practice themselves. Even then, hands-on experience under watch is necessary before students can become proper medical professionals and treat patients with accuracy. Surgeries can be risky for practice, as mistakes on a learner’s part can impact the patient. VR is allowing for more study options in medicine. Med students will be able to observe surgeries through VR, letting them lean in and see procedures in more detail without disturbing the surgeon. Several more observers will be able to take place in VR as well, without students having to sacrifice space. Students will also be able to practice procedures in VR, reducing costs of expensive, one-use cadaver equipment. VR practice provides a safe environment for students to practice, without putting patients at risk from any mistakes. Real-world, hands-on experience won’t go out of use, but VR will be a practice space to get students used to the motions they’ll take with patients. 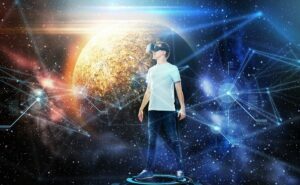 Space exploration has several applications for virtual reality, one of which is making simulations to prepare astronauts for what it feels like to be in outer space. Some simulations involve a walk on Mars to prepare for potential human landings. Other space simulations are also accessible to the public, letting non-astronauts have the experience of the view from space stations. NASA is also developing VR technology that allows for control of rovers on Mars. Instead of possibly imprecise console controls, VR direction can make much more precise movements for rovers and robotic arms once it completes development. Beyond just advancements in physical health practices, mental health can also benefit from VR applications. People who experience anxiety and depression can use VR to help practice relaxation techniques. A VR application that guided people with anxiety through deep breathing exercises helps reduce symptoms of anxiety attacks over the course of several minutes. Patients with PTSD conditions can also benefit from VR. Emersion therapy is a standard treatment to help PTSD patients by exposing them to their stressor and letting them learn to view it as a safe situation. Traditionally, PTSD patients will talk through and imagine their stressor scenario with a therapist, but VR allows for patients to fully experience their scene. Since it’s a simulation, the patient or therapist can turn it off if the patient becomes too stressed or overwhelmed. Mental health awareness advocates are also taking advantage of VR. A VR experience developed to show the events of autistics lets people understand the sensations and view of an autistic in a shopping center. A typical situation for most people can be very overwhelming for someone with autism. VR experiences like these can spread knowledge of mental health conditions for better awareness. During a trial, judges and jurors experience the crime scene through the descriptions of the lawyers and paper records of evidence. On the other hand, investigators have viewed the crime scene in real life, giving them a different understanding. This gap between two and three dimensions can lead to misunderstandings on the part of the jurors and different interpretations of the case. Bringing VR technology into the courtroom could erase this gap of understanding. Allowing jurors and judges to see the crime scene and evidence in virtual person could bring fresh perspectives to trials and increase engagement. 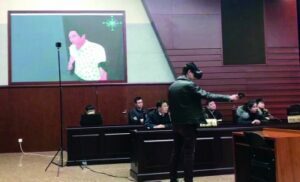 With the slow changing judicial system, it’s uncertain whether VR would become commonplace in the courtroom, but the idea has potential. Medical studies aren’t the only field to benefit from applications of virtual reality—companies and apps are already developing VR systems for the classroom at all levels. 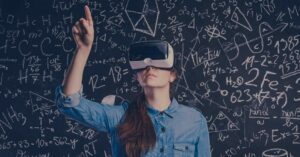 By using virtual reality, students can become more engaged in their learning experience through being able to interact with their learning material. Students can tour museums, other countries, and even space through virtual reality, allowing for greater lesson diversity. Teachers can supplement history lectures with VR trips to different places and points in time, making it more interesting than reading names and dates from a textbook. Biology students can engage with anatomy on a more intimate level than 2D images and diagrams. As VR technology advances, the number of education applications will likely increase as more content enters the market. Physical rehabilitation involves a lot of strenuous work. Exercises can be exhausting and painful as patients work to recover from accidents. Studies show that VR exercises help improvement by stimulating the parts of the brain needed for motion and movement, even in patients who have lost mobility. Online shopping has been popular since its conception, allowing for easy access to products from around the world. VR is starting to make its way into shopping as well. 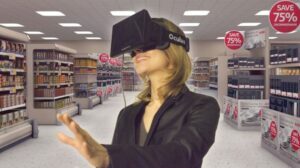 Instead of browsing online catalogs, which can have more options than one can conceivably look at, some stores are developing VR shops. With these virtual experiences, shoppers can browse an online store much like they would a physical store, bringing the fun of exploratory shopping together with the ease of ordering off Amazon. VR shopping also adds a social aspect into online purchases, allowing for users to wander around storefronts with their friends. Much like medical studies, military training can be expensive and dangerous. Though procedures take precautions, training exercises to invoke the real pressures of combat and equipment operation can still cause harm to participants. Practice runs with military jets and vehicles can run very steep costs over several trials. VR combat simulations allow for battle practice without the risks of damage to participants. They also allow for more military members to engage in the same training at once, helping build teamwork alongside strategy and decision-making skills. Virtual test runs of military vehicles provide trainees with a familiarity with controls before handling a real test run. The engagement of VR scenarios also better captures learner attention and increases retention rate. 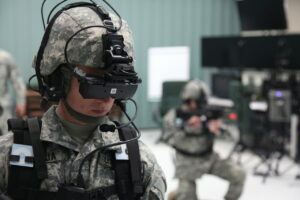 Military training is another area where VR will never replace real-life practices, as trainees need hands-on experience before entering real service and combat situations. Still, virtual training simulations can ease off some of the budget and danger of training while still preparing military members. With VR simulations of real-world places, the accessibility to the rest of the world increases. Even those who cannot afford expensive trips can still experience locations and get a taste of other cultures. Like with shopping, VR will also allow a shared simulation with friends. Though this may seem like it will negatively impact the travel industry, VR does not just need to be a supplement for venturing to your destination. You can also use it to get a preview of where you’re visiting, allowing for better planning. If you can’t pick between two locations, virtual reality can help you decide where to go. Some airlines are looking into including VR on their flights as well, to take away the humdrum of being stuck in a plane for an extensive amount of time. Passengers will be able to access a new level of entertainment and maybe even take the preview their destination. In time, VR may become the replacement for other forms of flight entertainment. Video calls have increased communication options for businesses, allowing for interviews, conferences, and business exchanges to take place over the internet and across any distance. VR is also capable of these things. Many companies may change from video chat to virtual conference rooms, increasing connections and engagement in meetings. Company members will also be able to share product information, project simulations, and advertising through VR. Car companies are using VR to test out vehicle features before building them. Some are even allowing virtual test drives for car buyers to try out different cars, which can decrease emissions from test drives. Architects have the duty of developing buildings for construction. This process involves lots of time to prepare, layout, and evaluate structures. With VR, architects will be able to use digital resources to help construct a building plan, reducing time spent on drawing. 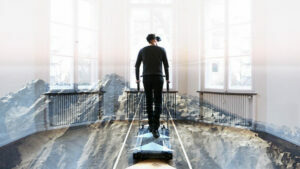 They will also be able to take virtual walks through buildings without going through real-world resources. 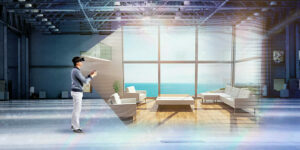 With VR, architects can see how their plans translate into 3D space and foresee any construction problems in advance. They can also test how long it takes to follow escape routes and redevelop if necessary. With virtual spaces, physical activities such as conferences can become more accessible to wider audiences. Moviegoers can become more immersed in their film experience, as with video games. Even news outlets are considering ways for their viewers to gain a three-dimensional experience of news stories and reports. As time goes on, only more applications of VR will come into play. 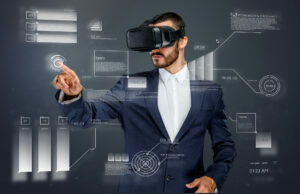 As more fields consider the possibilities, virtual reality can assist in an untold number of practices that we will only know once we explore the applications of virtual reality further.